Kodak No. 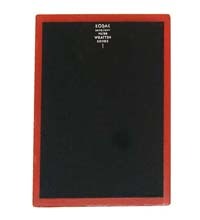 1 (red) 5"x 7" safelight filter as specified for certain blue-sensitive materials, most typesetting materials, Kodagraph Projection and some Linagraph papers. Please refer to the product data sheet packed with the material you are using to confirm that this is the recommended safelight filter for that specific material. These filters fit virtually all safelights that accept 5"x 7" filters. The filters are used and will have minor marks from previous use, but are certified to be in excellent condition. Supplied with a copy of the Kodak Safelight Filters data sheet, which includes instructions for safelight testing.